Equation Technologies has a series of Sage Accpac Tips & Tricks videos. We will be posting them here on our blog periodically. Please be sure to subscribe to our blog to receive updates when new posts are added! 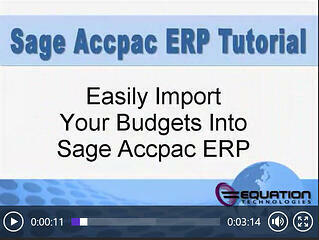 Learn how to easily import your budgets into Sage Accpac ERP! Sage Accpac ERP provides tools that allow you to develop your GL account budgets inside or outside the system. This tutorial will show you how an externally developed budget can be easily imported into Sage Accpac from an Excel spreadsheet.